Zipper: vintage brass Conmar slider on repro Conmar chain. This jacket is a B-3 test sample, made with American sheepskin, which we've colored ourselves. The jacket fits well on John, so if you're familiar with his sizing, this will fit well. The jacket is new and unworn. The original contractor of the 42-12690 label is not known. The sheepskin is not our typical format, but has the correct look, and like some vintage originals (especially Werber Sportswear), the fur color isn't very dark, but has a lighter shade of cream. Please note that sheepskin jackets are the most difficult to photograph, as cameras generally bleach out the fur compared with the colored leather. The jacket has Horween horsehide russet aniline trim, from the sleeves to the pocket and seam tape. The belts are a 6oz. aniline finish cowhide, and the zipper is a reproduction Conmar with a vintage Conmar slider. This jacket is very heavy and quite warm. It looks great when worn, and is extremely solidly built. Over time, the sheepskin will show wear (not to an extreme, but it will age). The horsehide will also show edge-wear, as it has a finish which will more easily show scratches and friction wear. The cuffs and wind flap are made of sheepskin from a different tannery, which is just a tick more yellow in fur color. The tannery which sold the main sheepskin didn't have the ability to cut down to 1/4" pile. Many originals we've seen show color variation in both fur color, and outer color. The cuffs and wind flap are also a tick darker in outer color, so that it would appear they're from a different tannery. This is all very subtle. In the shoulder reagion of the back panels, the fur is a little darker, too. The jacket would ideally fit someone in the range of 5'10" to 6'1" with a chest of 42-43.5", and a weight of about 185-200 pounds. 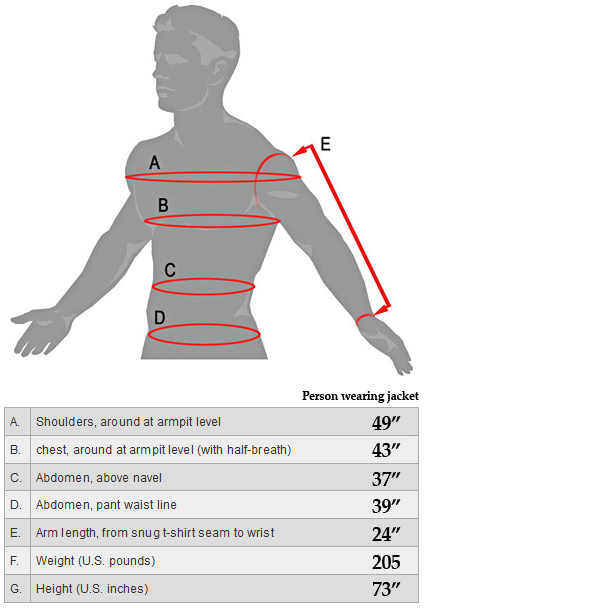 Front chest under arms 24.25"
Back width under arms 24.25"
Sleeves, from shoulder to end of cuff 26"